Mill-Max is pleased to introduce new connector products designed for combined signal and power transmission. These connectors eliminate having to choose separate connectors for power and signal, simplify board layouts, provide versatility and deliver reliable and consistent performance. 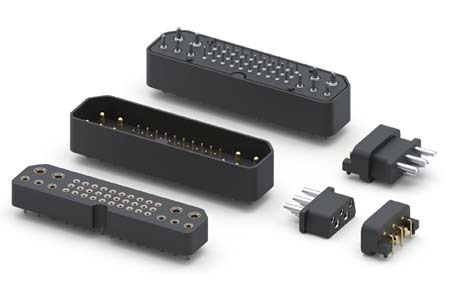 We are offering two new connector sets: a five pin, compact cable-to-board socket and header and a 40 pin board-to-board header and socket combination. The five pin connectors have two contacts for power and three for signal, the 40 pin connectors have 30 signal and 10 power contacts. The cable-to-board connector pair consists of a board mount male header, P/N: 888-30-005-20-002000 and a wire termination socket, P/N: 888-93-005-00-001000. The header has a combination right angle through-hole (3 pins) and SMT (2 pins) board termination with anchor pegs on the housing for security and stability. This male connector is shrouded and polarized for alignment with the mating socket and has .032” (0,81 mm) and .0435” (1,1 mm) mating pins plated 30 u” gold. The cable connector has solder cup receptacles to accept up to 24 AWG wire on the signal contacts and 20 AWG on the power contacts; the power receptacles are rated at 8 amps each, the signal at 4.5 amps each. The insulator housings for both connectors are made from high temperature Nylon 46 plastic, suitable for most soldering processes. This connector pair is ideal for powering small to medium devices and transmitting data. The male board mount connector is suitable for passing through a panel or faceplate of the device and the female is perfect for terminating to the cable end. The 40 pin board to board connectors each have a 3X10 array of signal contacts on .100” (2,54 mm) grid. The socket, P/N: 809-43-040-10-001000, has 4 receptacles rated at 11 amps each (.200” [5,08 mm] spacing) and 6 rated at 8 amps each (.150” [3,81 mm] spacing), the signal contacts are rated at 3 amps each. The large field of signal pins provides flexibility for future expansion; all 30 signals may not be required for a current design but are available to the designer for changes and enhancements (We can even selectively load the pin field upon request, contact technical services to discuss these options). The male header, P/N: 808-10-040-10-151000, is shrouded for protection and rugged applications. The connector housings are polarized for alignment and have stand-offs to promote solder flow. They are RoHS compliant and the insulator material for both housings is high temperature Ryton, suitable for most soldering processes. The mated pair height of these connectors is .415” (10,5 mm). They are ideal for rugged environments, industrial controls and other critical applications. Both of these new connector products offer the ability to transmit power and data signals via one connector; simplifying board layouts and your bill of materials. The pins and receptacles are manufactured using the high speed precision turning process Mill-Max is renowned for. All the receptacles in these connectors are fitted with hi-rel beryllium copper contacts. These manufacturing processes produce connectors rated to have no electrical discontinuity greater than 1 micro second for 50 G shock & 10 – 2000 HZ, 15G vibration.